Somewhere between electro-acoustic and folk, and between forest and ocean, emerges the music of Arborea, a husband-and-wife duo from Maine. Since releasing their first album Wayfaring Summer in 2006, Buck and Shanti Curran have toured regularly across the United States and Europe, absorbing sounds and experiences along the way that filter into their music. Red Planet (Strange Attractors Audio House, 2011), Arborea’s most recent album, conjures images of barren landscapes and misty forests; of sunny afternoons and contemplative hours; and the happy, although swift, passage of time. Buck and Shanti both skillfully play a large number of instruments—guitar, banjo, and harmonium to name only a few—and Red Planet features a handful of instrumental tracks, such as “Fossil Sea.” Shanti sings on most of the songs though, in a warm, sweet-sounding voice at times tinged with plaintiveness. Arborea’s music is captivating and unconventional in a way that keeps you wanting to experience more, and it’s well worth setting aside some time to listen to one of their albums. Already this spring, the duo has performed at SXSW and on NPR for a Tiny Desk Concert. They took time out of their busy schedule, which includes touring and homeschooling their two children, to catch up with Apsara in an e-mail interview. 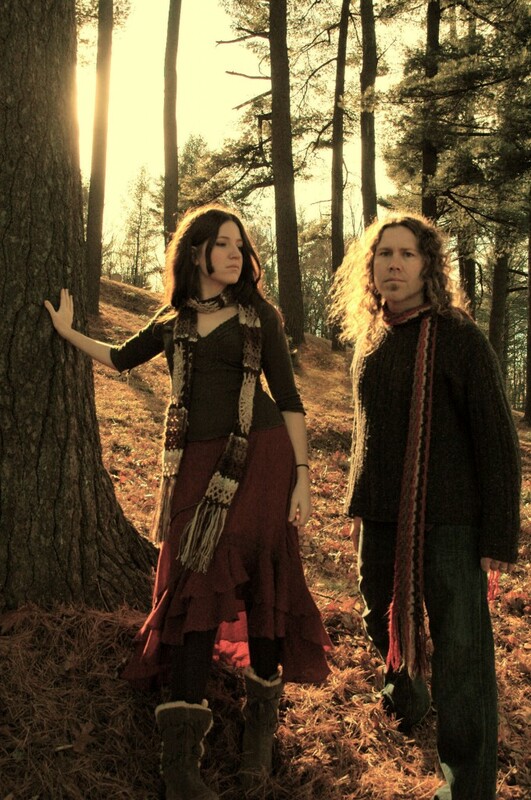 Arborea’s music has been dubbed as “psych folk,” “indie folk,” etc. How would you describe it? We’ve been called “avant folk,” “indie folk,” “psych folk,” “dream folk,” “free folk,” “folk rock”…but it’s not strictly folk. With elements of rock, blues, and Eastern modal music, you might describe it more as “soundscapes.” More often than not, our music is created as if it were a soundtrack for the landscapes and environments we’re moving through or interacting with, so it’s really impossible to say it’s just one thing. A lot of people associate us with forests and mountains, but we’re equally inspired by the power of the ocean and the rugged coast of Maine, as well as countries we often visit: Ireland and Wales, Italy, Spain, and Portugal. Your first album Wayfaring Summer came out in 2006, and you recently released your fourth album Red Planet. In what ways has your music evolved over this span of time? Our music has evolved quite a bit over the past seven years. We’ve gotten so much stronger and intuitive as a duo because we’ve dedicated everything we have to playing music and spend most of our time each year touring throughout the US, UK, and Europe. We heard a term recently in an old interview with Marc Bolan (T. Rex), in which he talked about the reality of life as an artist and touring, and how you don’t make a lot of money. But you do it because you “live your environment”—and that’s exactly what we do. Red Planet features renditions of “Black is the Colour” and “Careless Love” alongside your own compositions. How did you approach interpreting these traditional songs, which have been performed by musicians from many different genres? “Careless Love” is actually two distinct traditional songs. One version is a folk song about pregnancy, and the other is a blues song about frivolous love (Bessie Smith recorded a notable version in 1925). It’s origin though is an anonymous poem. Shanti randomly discovered the short poem in an old literature book and at the time we didn’t know about the other versions. We took words from the poem, then composed the song with our own rhythm, melody, and song structure. Our song is linked closer to the folk song, with the references to young love and pregnancy, and wearing the apron high and low. “Black is the Colour” is our own arrangement of a version that’s on the 1987 Martin Simpson and Jessica Radcliffe album True Dare or Promise. That song was passed down to Jessica from her mother, and most likely the source of the version that’s best known comes from the American composer and collector of traditional ballads John Jacob Niles. It’s a song with Scottish origins, brought to the Appalachians by immigrants from Scotland. The River Clyde in Glasgow is referenced in the lyrics and shows direct lineage to Scotland. We also have a version of “This Little Light of Mine” that we recorded for an Odetta tribute. Interpreting traditional songs can be a really fluid process and a lot of fun, because you have a solid reference point from which to start. Our approach is quite simple because the framework of the song is established. We can then improvise with all the existing parts: varying the melody, removing words, and adding new ones. One thing that’s of great importance to us is making sure that there’s plenty of space in the recording so the melody can shine through. That’s how we try to produce all of our music though, not just traditional songs. This month, you performed a lovely, three-song Tiny Desk Concert at the NPR headquarters. What was this experience like? We had such a great time! Bob Boilen and all of the crew at NPR are really down to earth and professional, so it made for a relaxing, fun experience. We homeschool our kids, and they were on tour with us and also got to see the NPR headquarters. After our session, NPR let us keep our van in their garage, so we took an amazing family walk around Washington, DC, and eventually ended up at the Air and Space Museum. This entry was posted in Feature and tagged Acoustic, Electroacoustic, Folk, Indie, Rock. Bookmark the permalink.